On Australia Day we come together as a nation to celebrate Australia and what it is to be Australian. It’s the abundance of the land; the harsh red desert and the cool blue ocean, the elements that conflict which make us so unique. Australia day is about celebrating these aspects; what we can achieve in this great nation because of our diversity and the boundless opportunities that surround us. Australia Day is a day the whole country commemorates its achievements past and present, celebrates our nation Australia as well as expresses its pride at being an Australian. 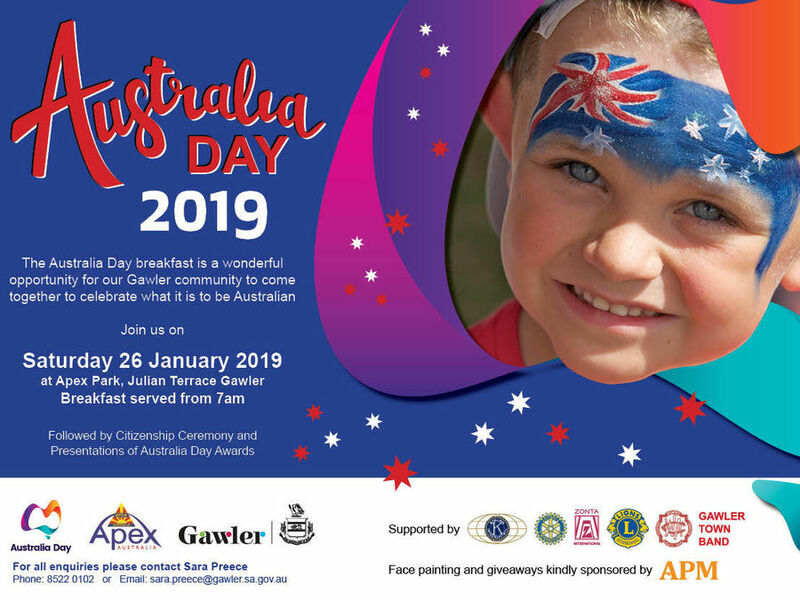 On 26 January the Town of Gawler, in partnership with the Gawler Apex Club, is excited to invite the entire community along to an ‘Australia Day Breakfast’. This breakfast is being provided by the Gawler Apex Club and other local service clubs and community groups, and will be followed by the prestigious Town of Gawler Australia Day Awards. The Council acknowledges the importance of celebrating those who have been especially involved with going the extra mile for the community as well as welcoming and rejoicing our new Australian Citizens who will be officially presented on the day. “The Council is committed to encouraging involvement in community life and feel honoured that we have so many people out in the region doing so many great things”, said Mayor Karen Redman.